You Have Been Chosen For Our New Touchstone Program! 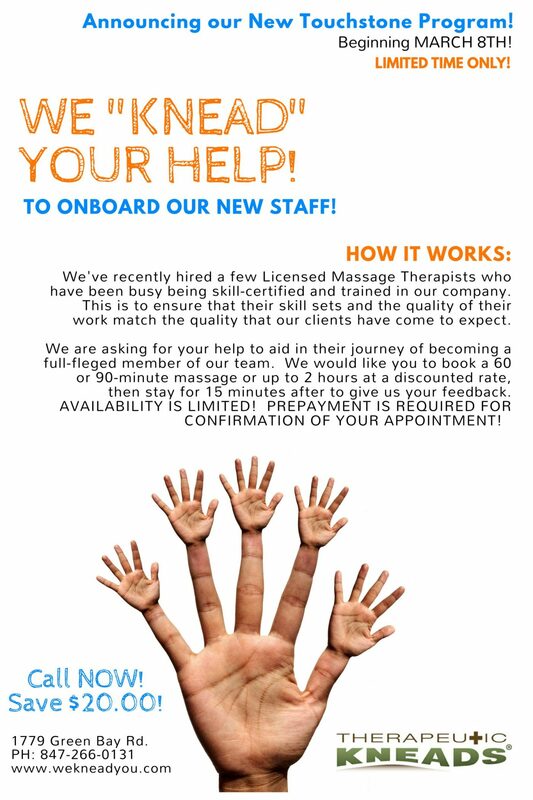 We have recently hired a few new licensed massage therapists who have been busy being skill-certified and trained in our company. This is to ensure that their skill sets and the quality of their work match the quality that our clients have come to expect. We would like you to book a 60 minute or 90 minute massage, or up to 2 hours at a discounted rate. Then stay for 15 minutes after to give us your feedback. The Touchstone Program begins on March 8th and there is limited availability- so book your appointment ASAP. Prepayment is required for confirmation of your appointment. *This offer is not valid with the Wellness Plan, reward points, or other discounts.